The Indian economy has taken a jolt of Rs 6.50 lakh crore due to drought in 265 districts. The Associated Chambers of Commerce and Industry of India (ASSOCHAM) has urged the government to help farmers who are suffering in oppressive drought, by offloading their bank loan repayments. As part of its relief measures to the drought affected rural population, the government should repay their loans and supply food grains to them at subsidised rates, ASSOCHAM President Sunil Kanoria said. Kanoria expressed this in a meeting with the Governor of Telangana ESL Narasimhan, when discussing issues related to the microfinance sector. The Chairman of Telangana Development Council of ASSOCHAM Srikanth Badiga, Secretary General DS Rawat and Senior Member P Nandgopal also accompanied Sunil Kanoria to the meeting on Tuesday. Expressing his concerns over rural crisis, the industry body President said, there is no meaning in achieving more than 7% GDP growth, when the majority population of the country is living in poverty and distress. 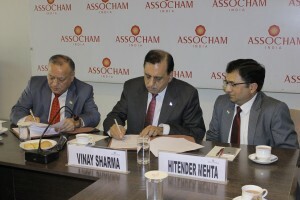 ASSOCHAM believes in holistic economic growth, which can help all the sectors including agriculture, trade, business and the industry, he said. Kanoria clarified that the industry body is not asking the banks to offer a moratorium or waiver on agriculture loans as they too are going through tough times in dealing with non-performing assets (NPAs). But the government should allocate some financial relief to the farmers and the rural sector, as the Government’s finance burdens have eased due to a dip in crude oil prices for over 18 months in a row. According to a recent survey by ASSOCHAM, the Indian economy has taken a jolt of Rs 6.50 lakh crore due to drought in 265 districts in 11 states affecting 33 crore people. Though the credit growth to agriculture has been the maximum among all sectors, the base for agricultural loans has been low. He was hopeful that the situation would improve with the onset of the monsoon in a few weeks. This would help agriculture and other allied sectors such as milk production, meat and livestock. While the economy has managed to withstand the pressure of two successive droughts, some sectors have come under severe stress requiring effective intervention. Kanoria also called for long-term solutions and increased spending in building rural infrastructure like village and semi urban roads, water sheds, small irrigation projects. The Centre and states should form joint teams to implement the relief measures that should reach the intended in days and not in weeks or months, he added. 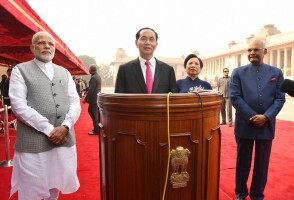 India has actively supported Vietnam in training, capacity building, defence technology .. Under the MoU, the major areas include sharing common information relating to SEZs and ..